Isn’t January a bit of a rubbish month? Who decided to make the first month after the Christmas break last for what seems like forever? Couldn’t we have a nice short month like February to ease us back into things? 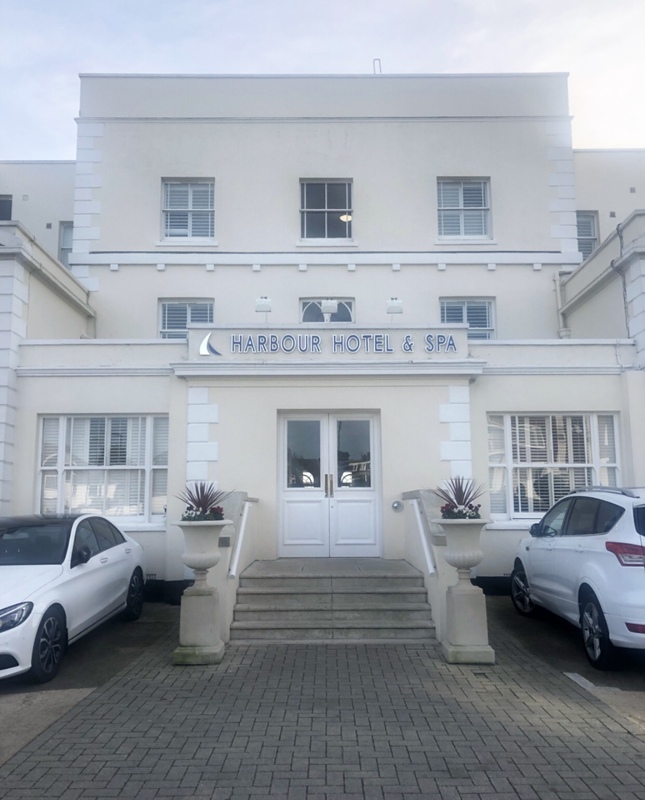 Fortunately I was invited along with some of the Bournemouth Bloggers to the Christchurch Harbour Hotel for a morning of relaxation in their brilliant HarSpa, which has recently had its treatment rooms refurbished. I had been to the spa over summer last year so already knew what to expect when it came to the spa itself but I was intrigued to see the new treatment rooms, where I would be having an express facial mid-morning. On arrival we were greeted and given a brief introduction to the spa and provided with towels, robes and slippers as well as a key card for the changing room lockers. Getting changed into our swimming things, we headed into the spa and spent a lovely hour switching between the sauna and Jacuzzi, which is set up above the main swimming pool and the perfect place to sit back and relax. We had been split into two groups of five, with the other bloggers attending an afternoon session. It was lovely catching up with friends and getting to know the others whilst we chilled out. There’s nothing like being cosy in robes and slippers to forge new friendships. We all had our treatments at the same time so that we could meet up afterwards for our lunch so we headed out of the pool area to meet our therapists and head to the treatment rooms. I was in one of the double treatment rooms for my facial and it would be absolutely perfect for best friends or couples wanting to enjoy their treatments side by side. The room was lovely and spacious with low level lighting, soft music and all the HarSpa products laid out ready. Having only had one facial previously, I wasn’t really sure what to expect. My therapist was lovely and reassuring and, when I explained I had a bit of a cold, she adjusted the bed so that I would be comfortable throughout. I totally zoned out during the facial itself – it was so relaxing and the atmosphere was just totally zen. I came out of the room after the 25 minutes feeling so chilled out, ready to join the other girls for our lunch. We all headed up to the hotel’s Upper Deck restaurant where we were greeted by the lovely staff who led us to our booth and provided us with menus along with jugs of iced water and juices. Gorgeous fresh bread and butter was brought to the table whilst we decided what we wanted and I happily tucked in, having built up an appetite whilst in the spa. I went for the chicken schnitzel (I am ashamed to say I wasn’t sure what this was and had to google to check I would like it first) with dauphinoise potatoes and greens. Amy also went for this and the rest of the group had the Fish and Chips, which looked absolutely delicious as well! The food was gorgeous and really filling, I almost wasn’t sure if I could manage the dessert but I was tempted by the brownie with salted caramel ice cream. I’m glad I caved as it was so tasty. I finished my meal with a full belly and a smile on my face. The whole morning had been so relaxing and just what I needed to combat those January blues. Before we left we headed out to the front of the hotel to look out across the harbour and enjoy the beautiful view. The weather was perfect! We also had to pose with Ruby the Camper Van, which belongs to one of the lovely Bournemouth Bloggers Jonathan, who was at the hotel for the afternoon spa session. Then it was time to drive home and head back to reality for the school run, feeling a little less stressed! The spa session, facial and lunch was complimentary, however all words and images are my own.